Corby Town went from one extreme to the other as they maintained their promotion push with a 5-2 victory at Welwyn Garden City. The Steelmen found themselves 2-0 down inside the first 20 minutes before top scorer Elliot Sandy gave them a lifeline just before the break. And Corby came out firing in the second half with Bradley Fortnam-Tomlinson’s first goal for the club soon after the restart proving to be the springboard for the fightback. Steve Diggin put them in front with his second goal in as many games since returning to the Steelmen before Sandy’s second of the night and Joel Carta’s 21st of the season in all competitions wrapped up the points. 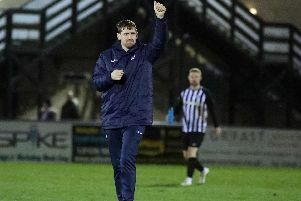 The victory saw Steve Kinniburgh’s team move to within four points of Evo-Stik League South Division One Central leaders Bromsgrove Sporting and to within two of second-placed Peterborough Sports who head to Steel Park for a top-of-the-table showdown on Saturday. And Kinniburgh was left to reflect on a tale of two halves. 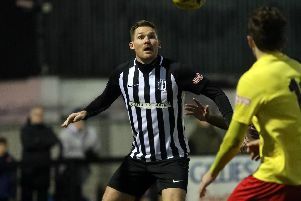 “Obviously we didn’t get off to the best of starts,” the Corby boss said. “It’s always difficult on a Tuesday night when you have to travel for a couple of hours and you have to fight through the traffic but we didn’t start the game properly and we have found ourselves a couple of goals down to their two shots on target in the early part of it. “They had a couple of half-chances after that and so did we and then we got the goal but it certainly wasn’t our best 45 minutes of the season. “You can talk about the timings of goals and things like that but the truth is, even if we had scored twice in the first half, my half-time team talk wouldn’t have changed. “The performance in the first half wasn’t good enough and everybody accepted that. “But the timing of the second goal was crucial, to get it so early in the second half really set us up and the performance was completely different. “The second 45 minutes was exactly what we have been talking about all season when it comes to getting ourselves up to the right level.